We love a timeless fairytale, but we think it may be time to put a new spin on a classic! Why not put your signature twist on little Red’s story as you parade this party-worthy look around? You can really shake things up with this costume; it looks classic--the cape, the dress--but your storytelling skills will help it shine. Maybe in your version, the wolf sees how fierce you look in this outfit and runs the other way. Or maybe you two will team up and start a life of crime. Heck, maybe the wolf will even ask Grandma to the big barn dance! 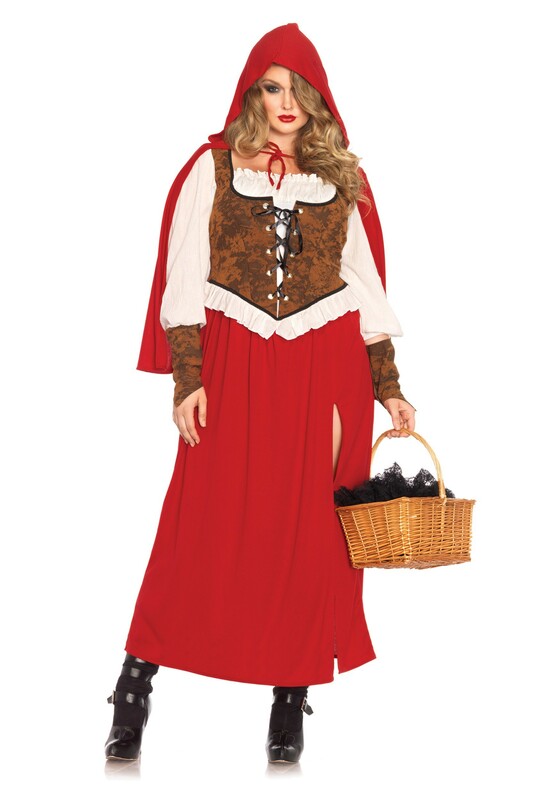 This tried-and-true Plus Size Woodland Red Riding Hood Costume frees up your imagination to take Little Red Riding Hood on a whole new adventure! Your Red Riding Hood may not even like forest strolls, maybe she’s more of a beach gal. Perhaps your version takes place on a glacier. Or the wolf could simply be dropping in to see that Grandma’s cable is working properly. The point is, the sky’s the limit when it comes to innovating tall tales. So go ahead and get modern with the plot, because this one-piece dress (styled to look like a skirt with a vest over a peasant blouse) and iconic red cape will ground you in familiar territory. Fill your basket with baked goods for your pals, or update the look and carry a messenger bag. Either way, everyone’s big eyes will be on you--all the better to see you in this classic costume. Bought one for my daughter to wear to a fair. It fit perfect (I think I went one size up). The slit wasn't as far up as it looks online, so that was good. Got a lot of compliments on the costume. Would recommend it. It came just as pictured.